Yes, it can. Because the people, or citizenry in a non legal sense of the term, have always been the true source and backing of governmental power, by our consent. A citizens led arrest, if well organized and coordinated, can work to notify the defunct powers that be that we do not consent. And where necessary, defend our freedoms from cabal controlled minions. This is the well regulated militia the founding fathers outlined in the 2nd Amendment. Not only is a Citizens led mass arrest possible, it is spelled out clearly in the constitution that we must do so for posterity. Briefly, our true relationship to government is a trust relationship. Whether it be the constitutional republic or the cabal controlled corporation, any form of government requires the consent of the people. How this consent is procured is what determine if a government is honorable or not. On earth, all governments are tyrannical and fraudulent, within Equity Law as supported by Natural Law, because they fail to disclose the full facts which are required for honorable consent to be given. Honorable consent, a binding contract, requires full disclosure and transparency by both parties - so as to be 'on the same page' about what each is agreeing to. This is known as explicit consent, because it requires a clear and concise affirmation of what is being agreed to by both parties. Implied or tacit consent is the form employed by governments the world over. When government makes a claim, that you are incompetent and an enemy of the state (“Trading With The Enemy Act” (Sixty‐Fifth Congress, Sess. I, Chs. 105, 106, October 6, 1917), and as codified at 12 U.S.C.A. 95a. ), it creates a presumption becoming a cured fact under Equity Law. This cured fact can then be used to create an agreement between you and the government to manage your affairs for you, because you are incompetent. For example, if a friend comes over your house and begins taking food out of your kitchen to eat, unless you tell them to stop, your friend presumes you agree to his actions because your inaction implies consent. The solution is simple. We must stand up, notify them of their breach of trust, and most importantly, notify all those who have consented by their inaction, the sleeping masses. In this sense there really is no grey area, either you are working for the cabal by implied consent or you are acting to undo the tyranny by un-consenting. Literally every action we take is either a move towards freedom or acquiescence to slavery. Everytime we see the police state coercing another with a speeding ticket, dishonorable arrest, or violence, we are consenting by doing nothing. How the un-consenting behavior looks takes on many forms, but the point is action must be taken, whether within by learning and educating one's self or by sharing the truth with others. The hard truth that many awakening minds are realizing is that in order to make real moves in the march towards freedom, our own lives will be put at risk. Speaking the truth is difficult, and can often feel lonely, as we try to slowly share what we have learned with our sleeping fellows. Taking action is even more difficult, because to act in truth and freedom, on a world of slavery and ignorance, is heresy. Protesting and meeting in groups helps draw awareness, but does little to make any real change. 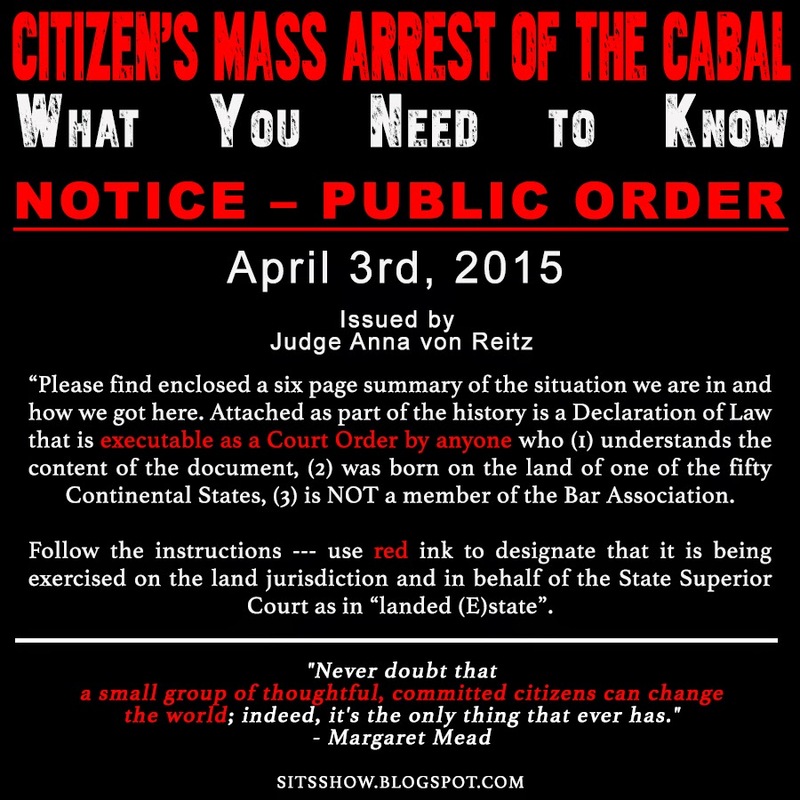 Notifying the Cabal of their breach of trust, helps create the lawful backing for large group action of citizen arrest, but one man or woman can not arrest the entire cabal; especially when the general population has given them a mandate to rule. The core issue is each persons knowledge level, and what they do with that knowledge. As such, knowledge must be shared, and understood completely, which will empower each individual to realize how their actions are contributing to either freedom or slavery. The bottom line is this must be a unified effort. The awakening movement, so to speak, is growing exponentially, and the cabal know this. They know that their only hope is to keep us divided and distracted long enough to gain consent from the sleeping masses to declare us enemies of peace. Remember, in a world of slavery and dependency on 'daddy government' someone who wants true freedom and personal sovereignty is a threat to government. It's only a matter of time before the cabal legal systems which make searching for truth and freedom illegal, come to pass. One day reading these words could mean being put in jail. Persistence is the key, and this is why the cabal does everything they can to keep us distracted. We may realize what is needed above, but then something happens to drain our motivation. Maybe it comes in the form of some ET savior, or insider saying 'the good guys are coming to the rescue, no need to take action!' Or simply trying to survive in modern life is enough to keep us busy. Its a slow process of spreading awareness, building personal knowledge within and once we're ready, taking action.